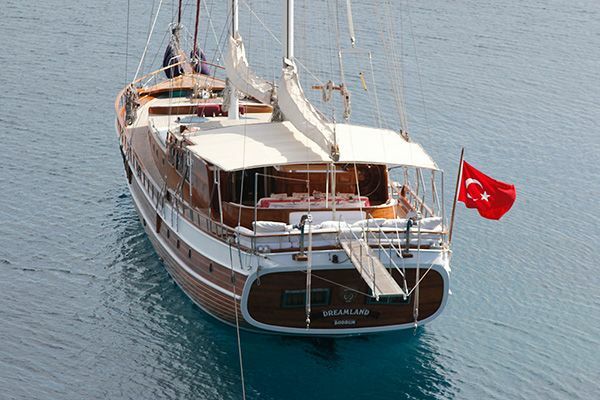 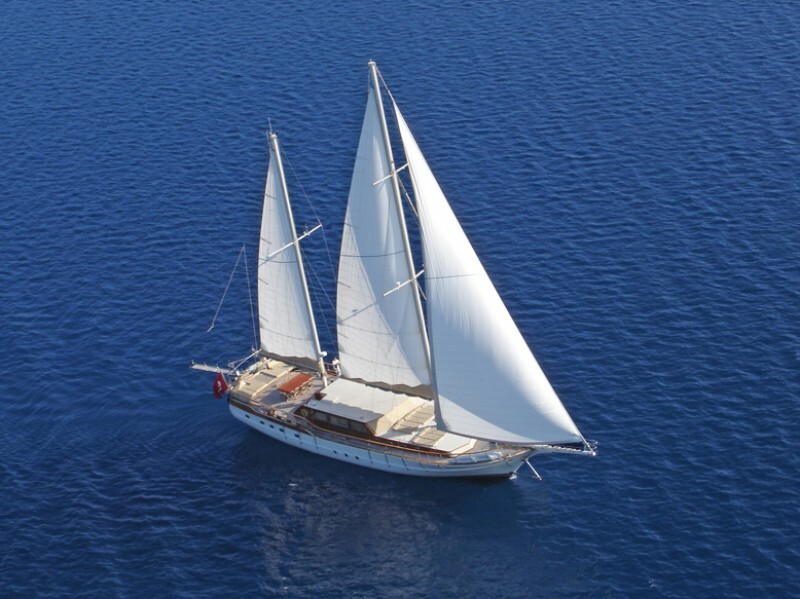 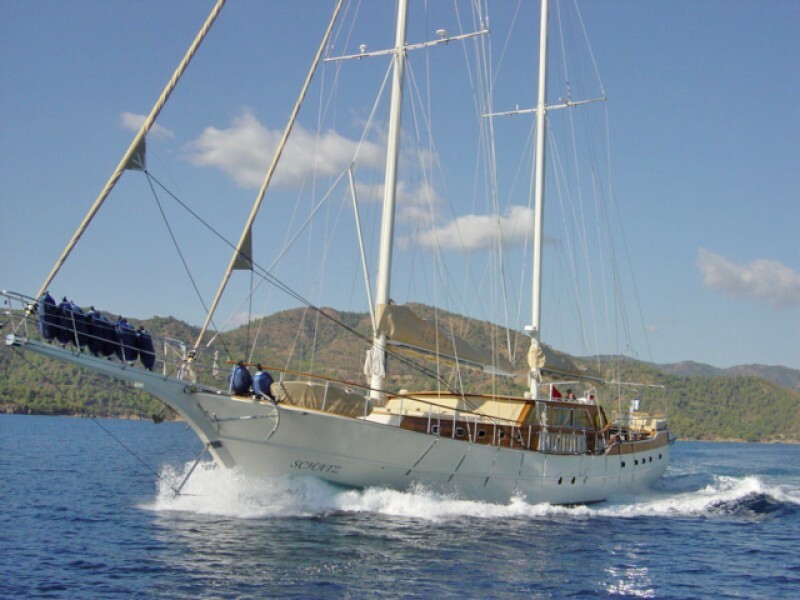 The deluxe gulet Schatz is a superbly finished charter motor-sailing yacht which offers all the space and comforts afforded by a no-expense spared refit in 2013. 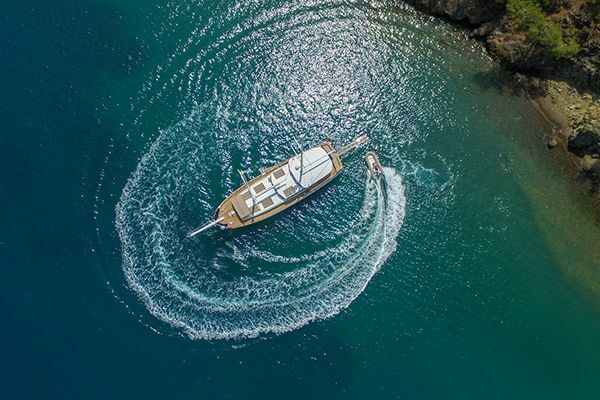 Up to ten guests can enjoy all the luxuries to be expected in a large gullet of this calibre, with five spacious well-appointed air-conditioned cabins and the immense deck space that is ideal for relaxing and entertaining. 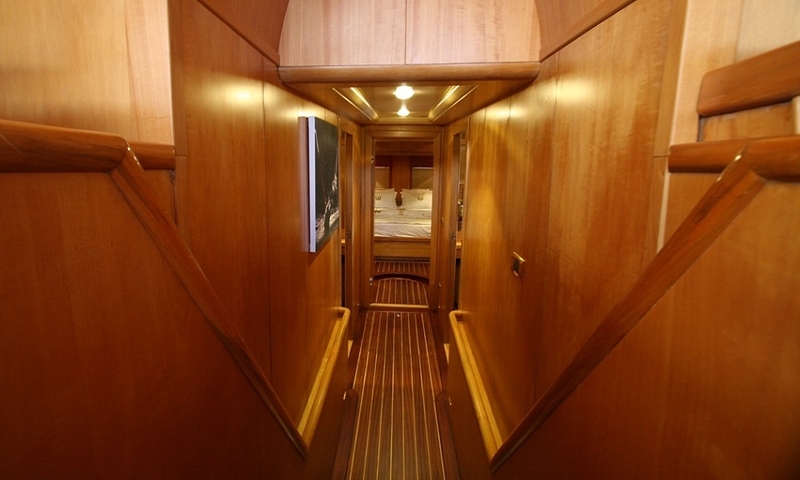 The detailing of luxury timber linings is evident throughout the cabin and indoor saloon giving a light nautical style. 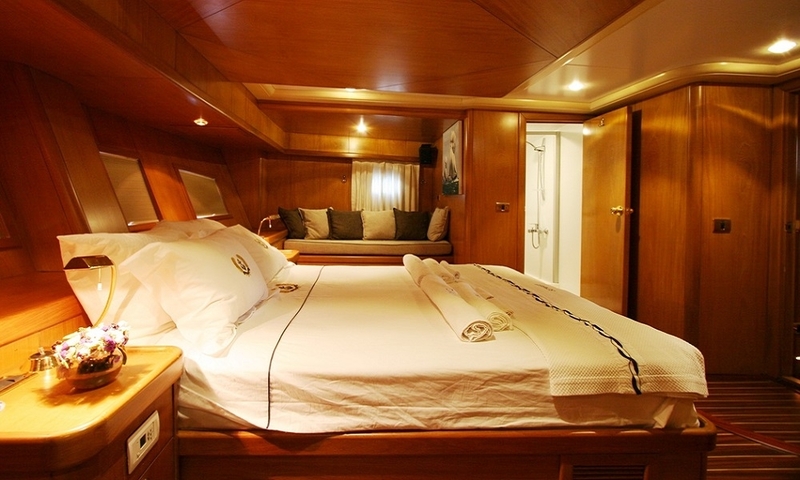 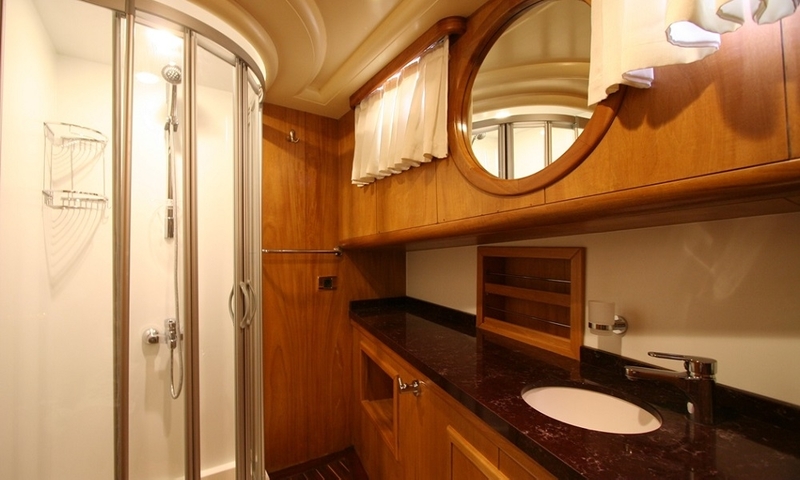 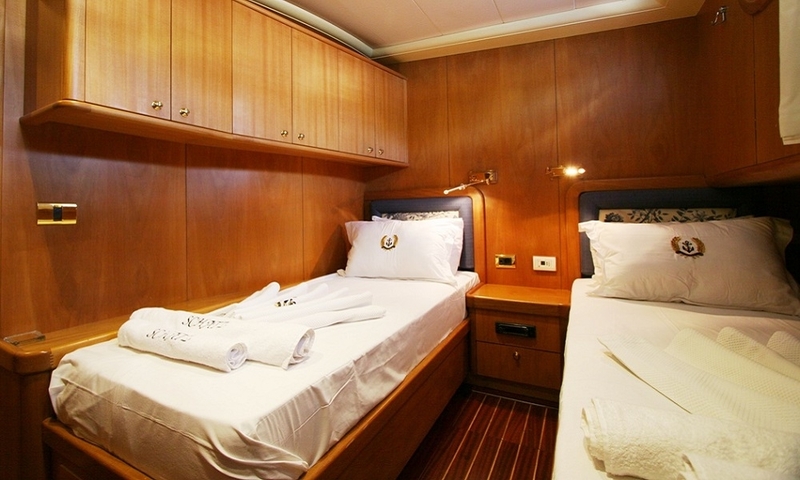 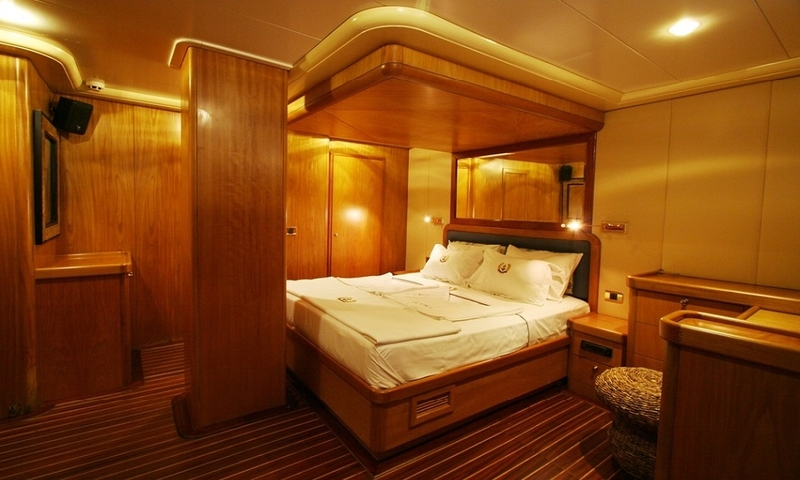 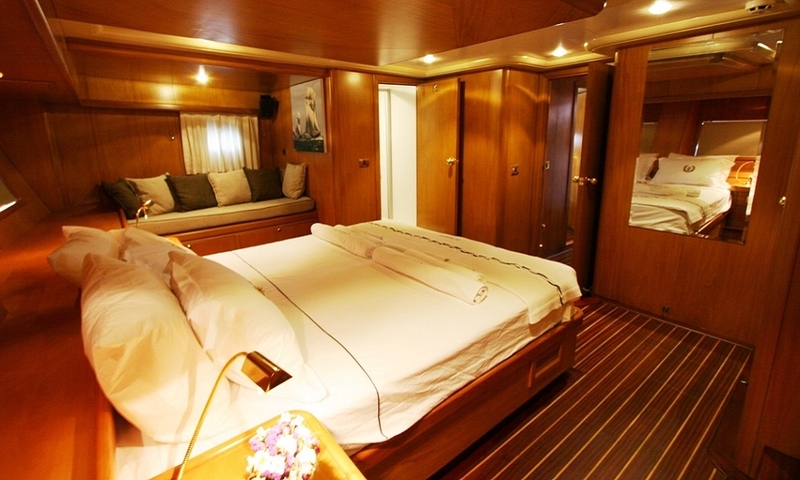 The fore and aft master cabins with queen sized beds offer full beam width space for robes, including a walk-in robe for the forward cabin, sofa benches, mirrors, desk and good size bathrooms with all amenities. 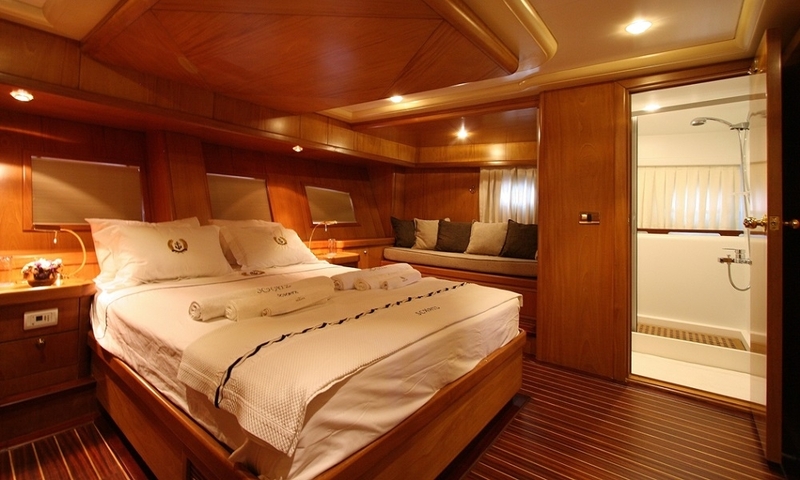 The two identical double bed cabins on luxury yacht Schatz have queen size beds, while the fifth cabin is a convenient twin bed cabin. 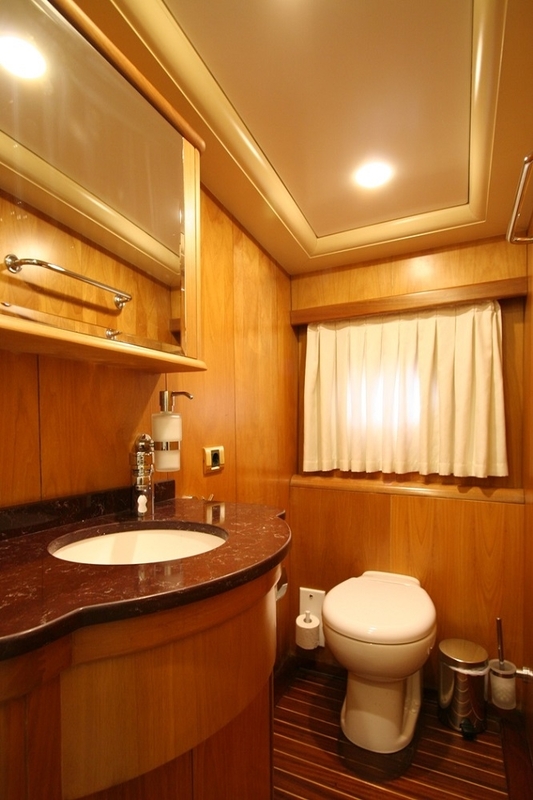 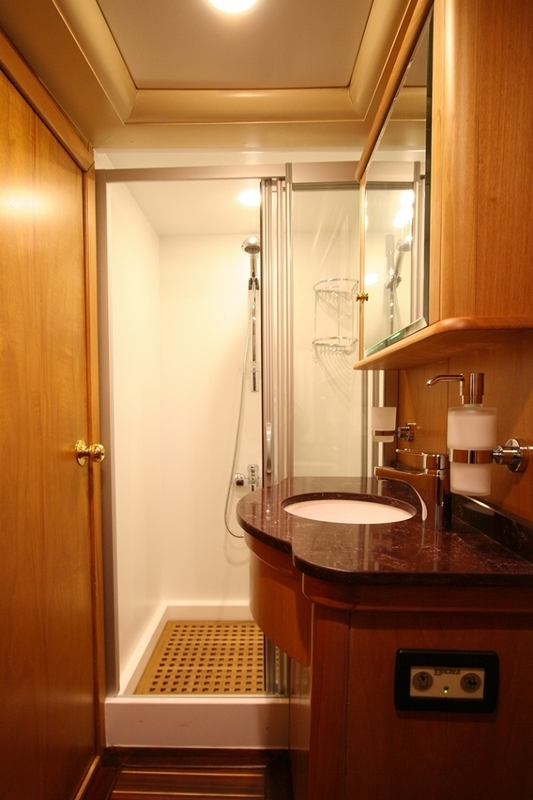 All cabins have air-conditioning and well-appointed bathrooms. 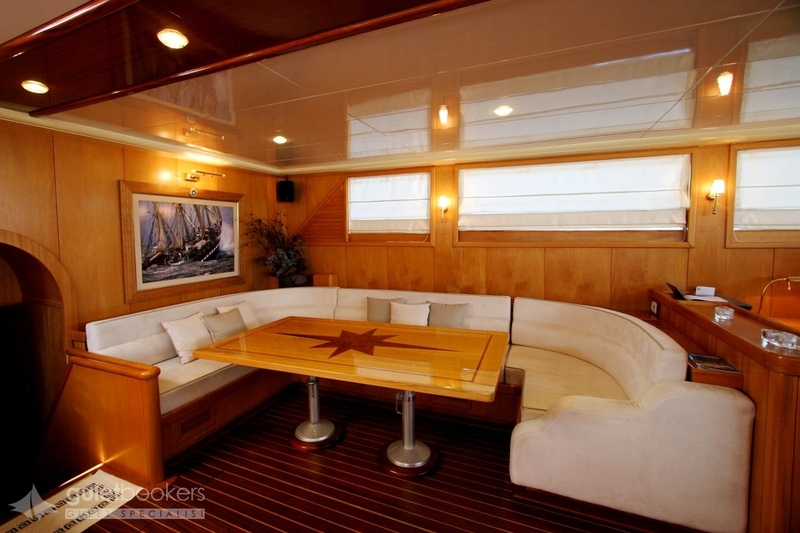 The indoor saloon is also air-conditioned, offering a well-designed space for both dining and relaxing with a bar and a TV/DVD music stereo system with satellite and local channels, and where internet is available. 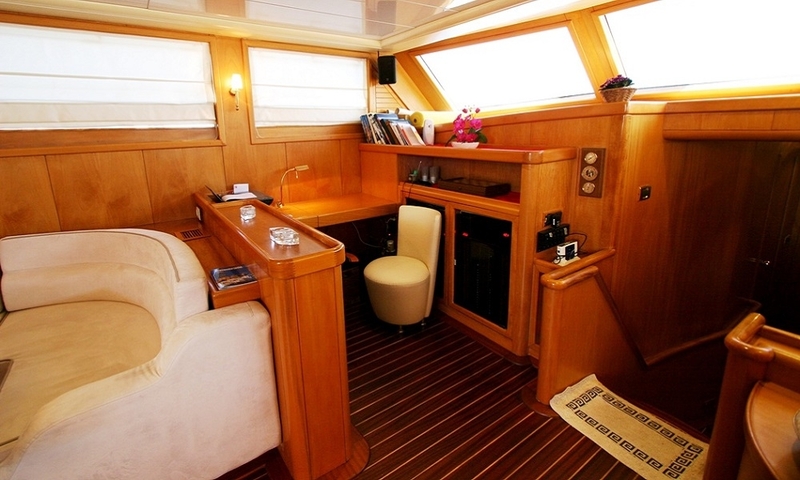 The saloon also holds a home office nook for laptop and printer. 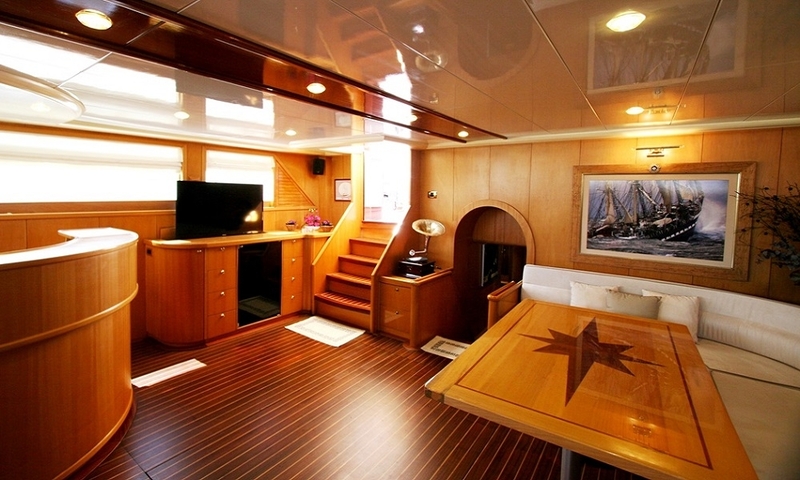 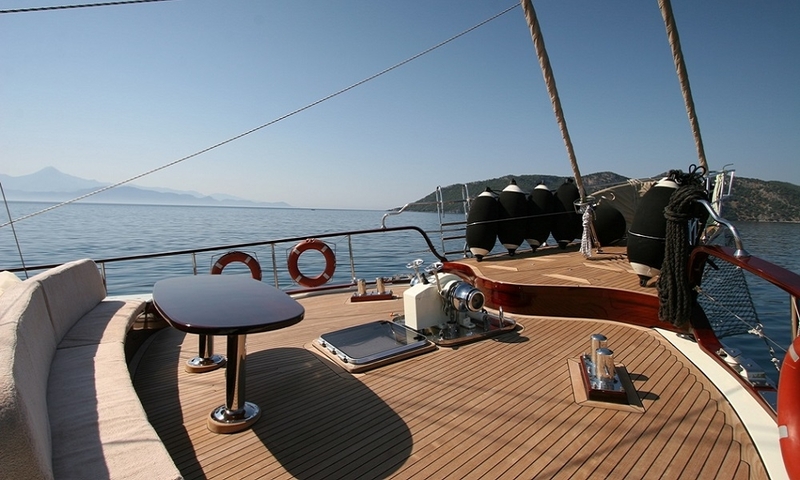 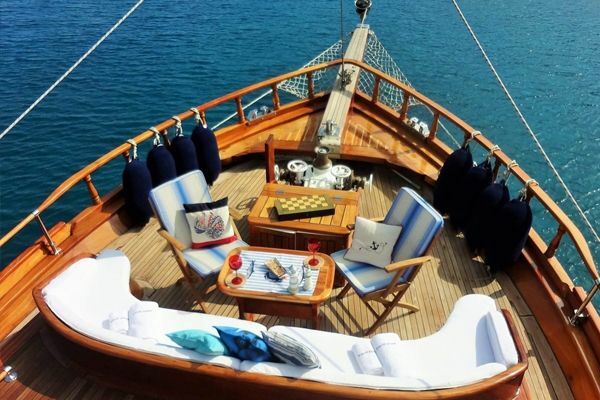 The long teak deck on Schatz gullet holds the secret to an enjoyable cruising holiday, with ample space for the shaded aft deck dining table and the stern width bench of lounging cushions, while sun seekers revel in the fore deck collection of personal sunbeds, and on the owner’s special, a delightful curved cushioned sitting area on the bow section of the deck for cocktails at sunset. 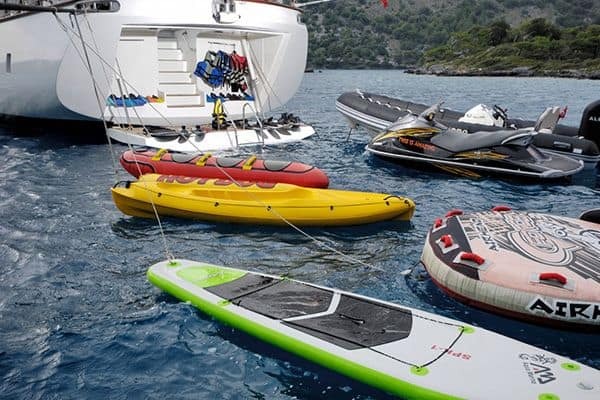 The tender is more than capable of coping with the full range of water ski gear on board, or the active guests might like to request other water toys. 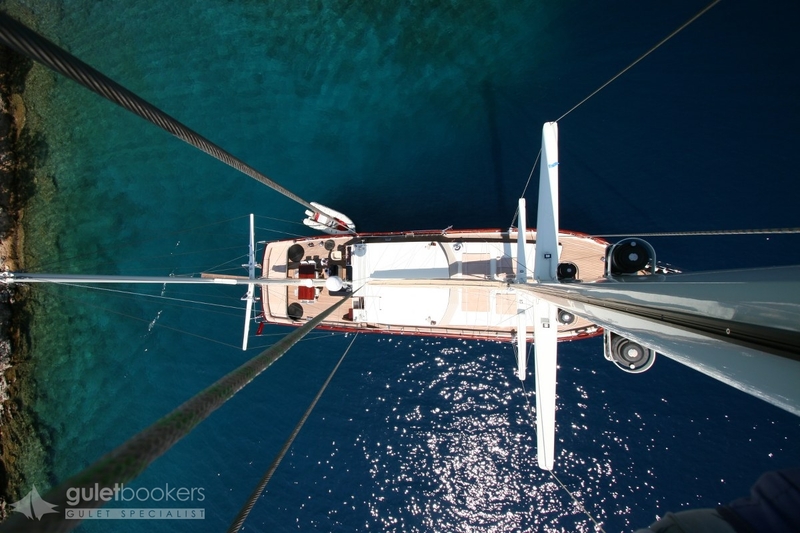 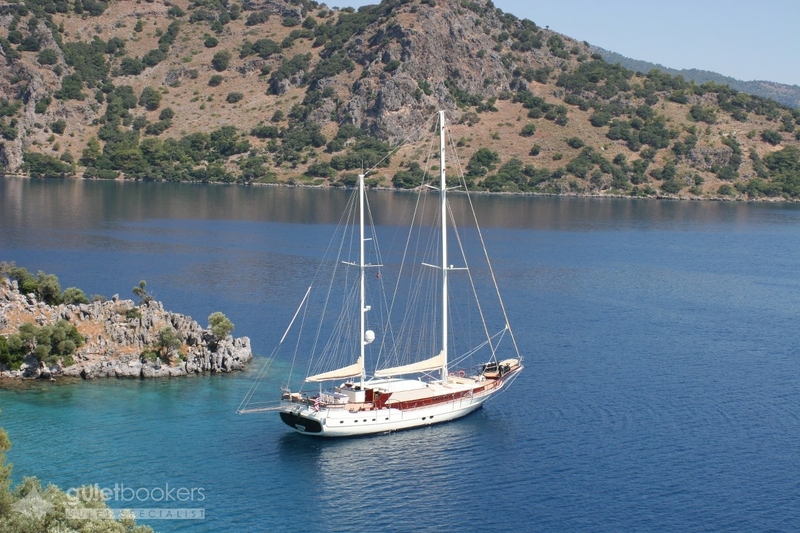 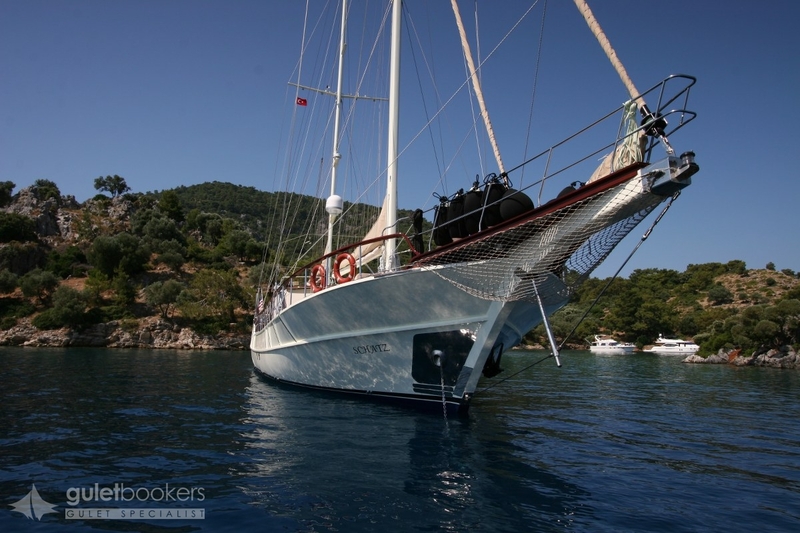 For the quiet anchorages the canoes tempt for a quiet paddle into the turquoise coves, while the full sailing rig complete with aluminium masts, renewed running rigging and lines, and winches, make sailing a total pleasure. 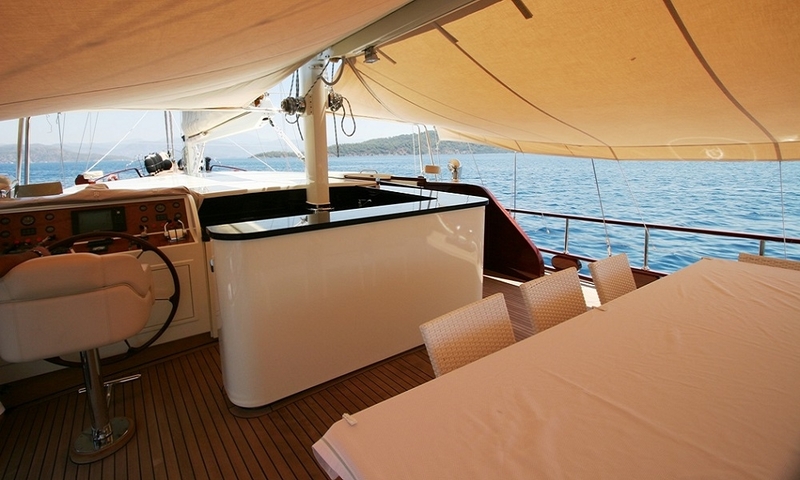 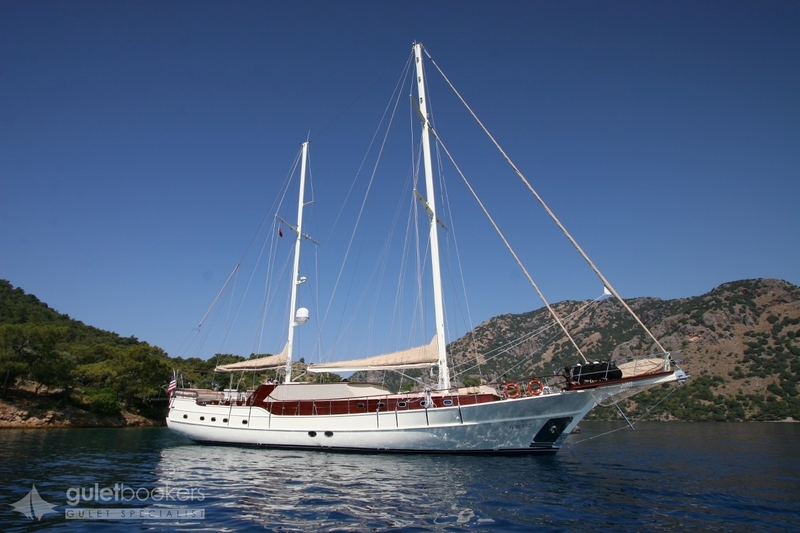 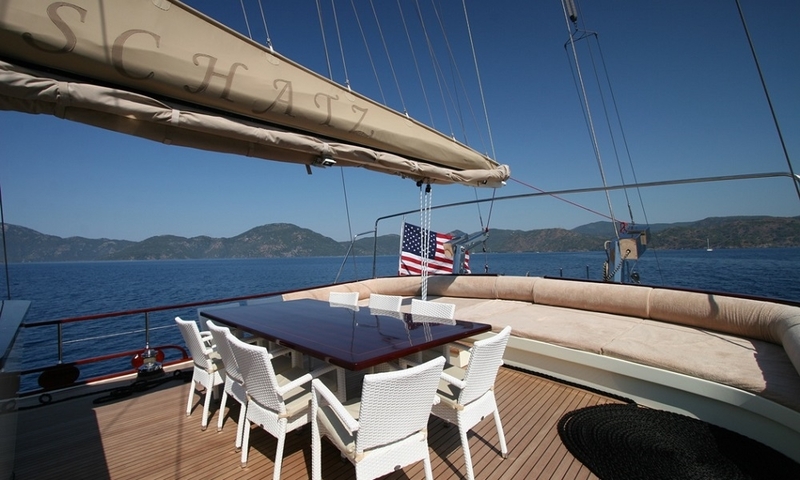 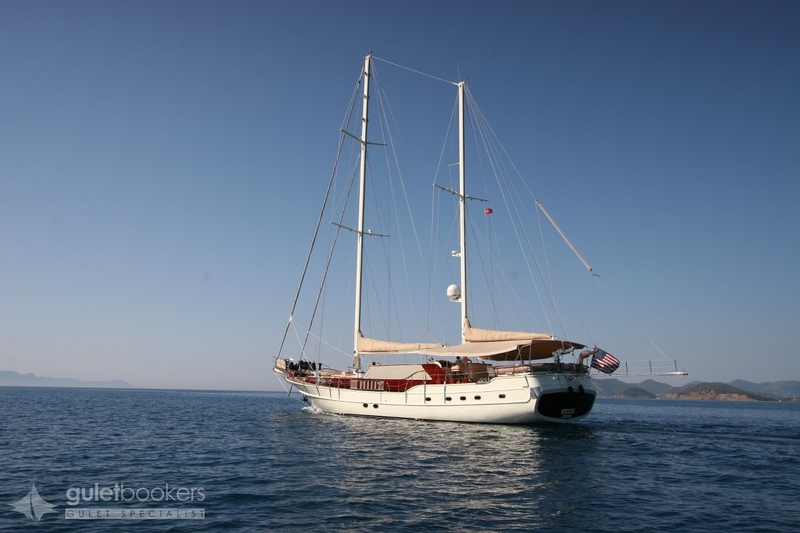 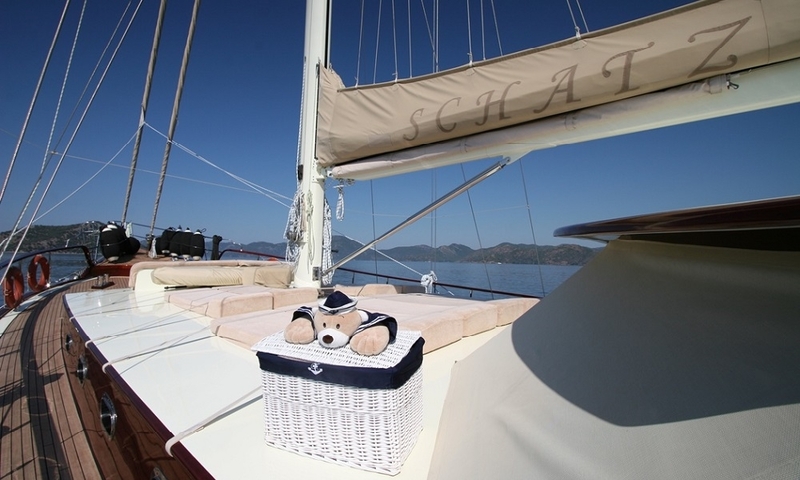 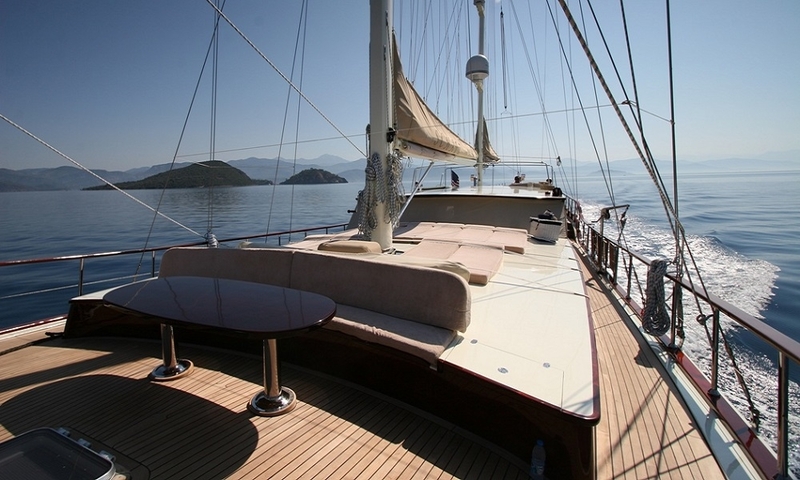 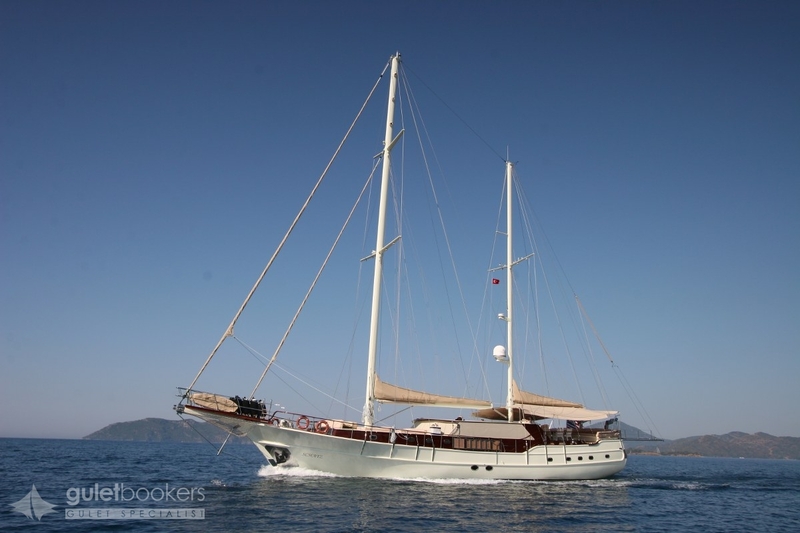 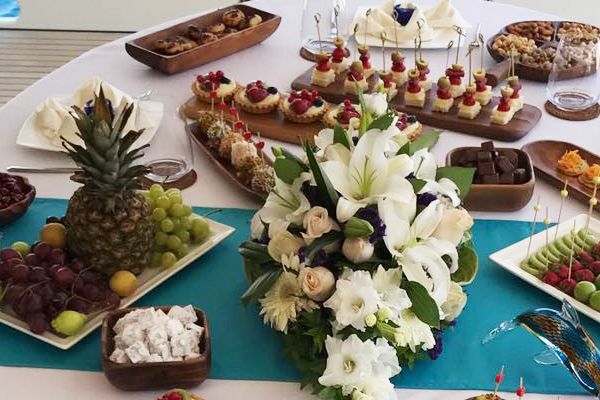 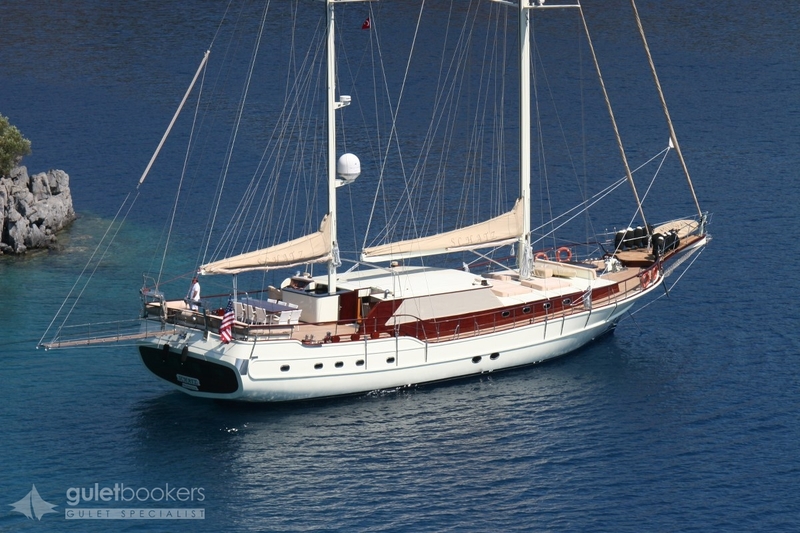 A much sought-after yacht for charter in Turkish and Greek waters, with a highly professional and hospitable crew, the Schatz offers an unforgettable cruising and sailing holiday.